This is a very Luis Royo image to me. Beauty, ugliness, apocalypse, culture. No matter how I set my graphic card’s settings, however, I just was not able to get rid of the anti-alising on her hair. That’s annoying. Not my best work, but who said that a picture has to be perfect to evoke emotion and imagination? Oh who am I kidding? This was an excuse to experiment with Windlight, me having just acquired a video card. /End confession. 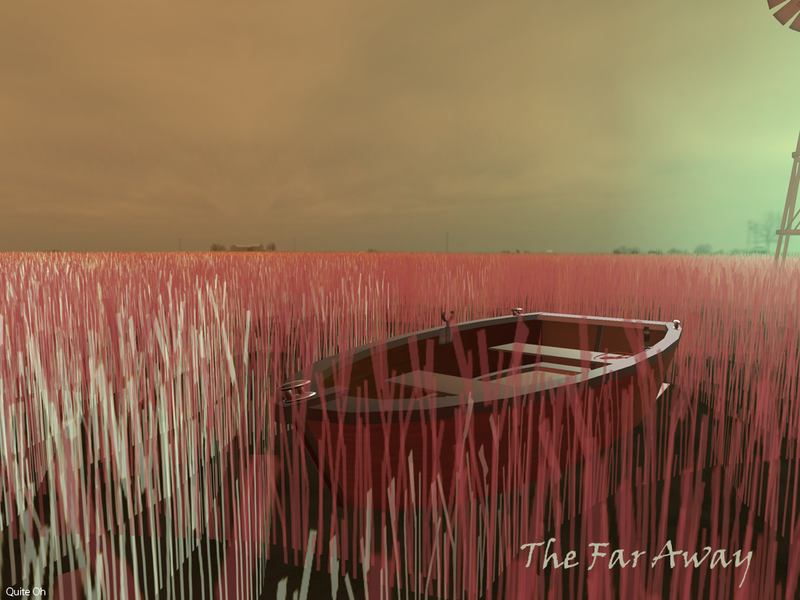 The Far Away: Death, or New Life? I often spend time just practicing the getting the right shot. Since I’ve just recently gotten a new video card for my machine, today’s experiment involved playing with Windlight for the first time. It’s deep, rich and scary! And I can see that as of now it’s an absolute must-master skill for those to aspire to be the best SL photographers they can be. This particular image uses the Costal Afternoon lighting and the Clear water setting. I wanted to balance the lovely gold of the field, matching the dresse’s red with the light umber light of the afternoon and the clear blue of the sky. I like the way it turned out, but in the future, I’d like to have a better understanding of how to edit the sky. Compare this with the default blue water. This was taken at AM Radio’s The Far Away. AM is a master of creating sims that are deep and rich, and emotionally evocative. Some people’s sims are a testament to their building ability, other’s their vision and creativity. AM’s are simply the kind that speak little and evoke a quiet stirring in our soul.